Want the White Working Class to Live Longer? — Fight for Real Healthcare! ❝ The U.S. white working class is in big trouble. The data is piling up. Economists Anne Case and Angus Deaton have a new paper out, exploring mortality trends in the U.S. The results confirm the finding of their famous 2015 study — white Americans without college degrees are dying in increasing numbers, even as other groups within and outside of the country live longer. And the negative trends continued over the past year. ❝ Why is this happening? Case and Deaton don’t really know. Obesity would seem like a possible culprit, but it’s also up among black Americans and British people, whose mortality rates from heart disease have fallen. 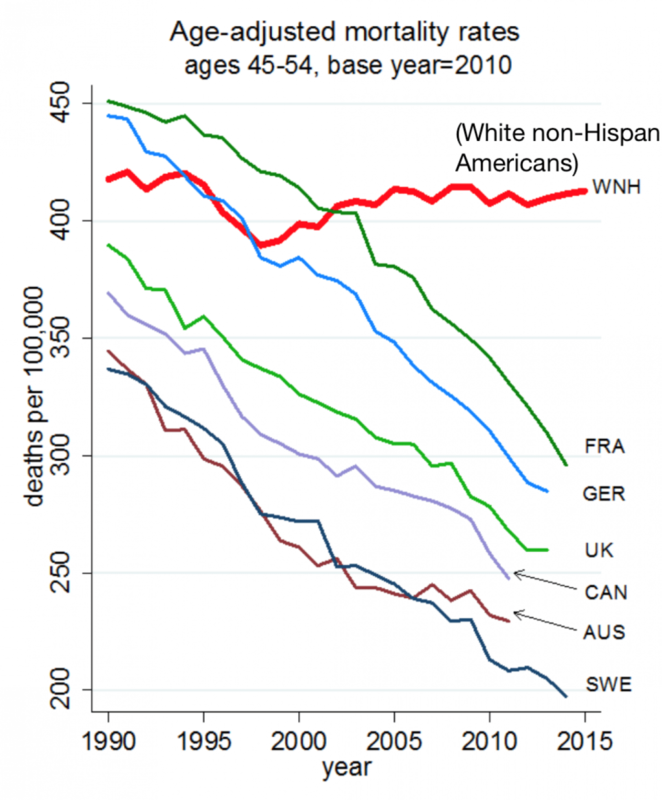 Deaths from suicide, alcoholism and drug overdoses — what the authors collectively call “deaths of despair” — have been climbing rapidly. But they only account for a minority of the increase. And no one knows the definitive reason for white despair. ❝ …But whatever the cause, I know of one policy that would go a long way toward fighting the baleful trend — national health care. Though the Pentagon is allowed to do for our military. ❝ Finally, an NHS could prevent overuse of opioids. Prescription of painkillers has been a major factor in the opiate epidemic, which has hit the white working class hard. Drug manufacturers, however, have lobbied to preserve widespread access to opioids. These companies have also given doctors incentives and perks — essentially, bribes — to keep prescribing these dangerous drugs. An NHS would be able to resist lobbying pressure and make sure doctors didn’t have an incentive to hand out too many opioid pills. ❝ A NHS wouldn’t require the creation of a new bureaucracy — it would just require expanding Medicare to cover the whole nation. There’s already a campaign to do this, led by none other than Senator Bernie Sanders. An NHS also wouldn’t prevent rich people from buying expensive or rapid treatment in private markets. I agree with Noah. “If…Trump wanted to prevent the people who elected him from continuing to die in rising numbers, he would join Sanders in the campaign to extend Medicare to cover all Americans”…But, then, we already know Trump is a pathological liar. I wouldn’t trust him to carry through even on a promise to Bernie – much less the rest of us. No, I like the idea of supporting the election of for-real independents regardless of whatever political label they want to slap on their foreheads. Fight for single-payer expansion of Medicare to all and I’m there, Bubba. BTW, Noah Smith is one of the jillions of folks on Twitter actually worth following. ❝ Spiders are quite literally all around us. 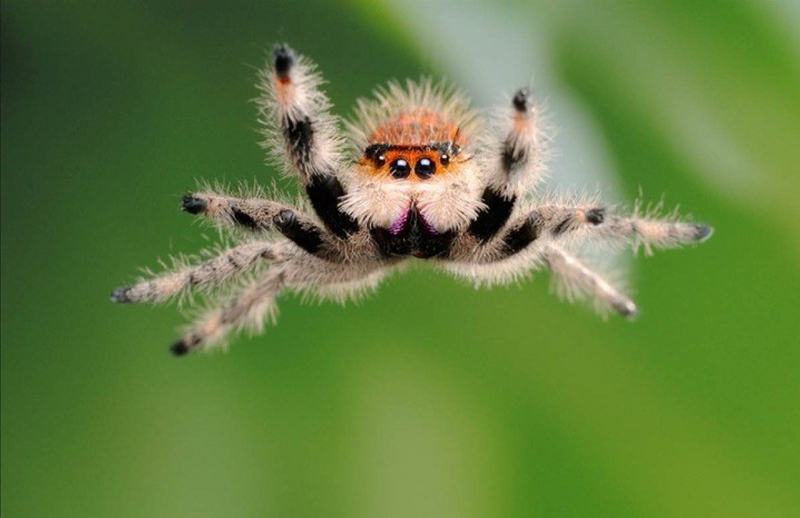 A recent entomological survey of North Carolina homes turned up spiders in 100 percent of them, including 68 percent of bathrooms and more than three-quarters of bedrooms. There’s a good chance at least one spider is staring at you right now, sizing you up from a darkened corner of the room, eight eyes glistening in the shadows. ❝ Spiders mostly eat insects, although some of the larger species have been known to snack on lizards, birds and even small mammals. Given their abundance and the voraciousness of their appetites, two European biologists recently wondered: If you were to tally up all the food eaten by the world’s entire spider population in a single year, how much would it be? ❝ Martin Nyffeler and Klaus Birkhofer published their estimate in the journal the Science of Nature earlier this month, and the number they arrived at is frankly shocking: The world’s spiders consume somewhere between 400 million and 800 million tons of prey in any given year. That means that spiders eat at least as much meat as all 7 billion humans on the planet combined, who the authors note consume about 400 million tons of meat and fish each year. Or, for a slightly more disturbing comparison: The total biomass of all adult humans on Earth is estimated to be 287 million tons. Even if you tack on another 70 million-ish tons to account for the weight of kids, it’s still not equal to the total amount of food eaten by spiders in a given year, exceeding the total weight of humanity. RTFA more even more info aimed at making it harder to fall asleep at night. In a nice, warm, dark room.